I wanted to share with you a makeover I did for a music video shoot. The look was a gold smokey eye and red lips - classic video vixen. Check it out! I had a 7am call time in the parking lot of a park in Atlanta. I set up my chair outside my car and used the top of my trunk to set up my kit. I carry a blanket in my car for emergency situations like this...it was super cold so I was able to cover up the model which I did the makeover. 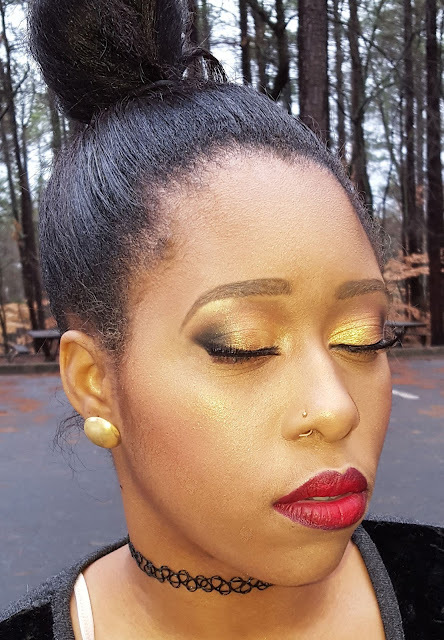 I applied a mix of gold and bronze eyeshadows in her eye to achieve this look. I am in love with Makeup Geek's corrupt eyeshadow, a truly black shade to give a bit of smoke to the eyes. I paired the smokey eye with a more defined brow. I am a fan of lighter brows...I always go lighter than the hair color. I think it's super soft and flattering on most clients. We shot in an a park with abandoned mills. The scenery was beautiful. Here's a live shot. Can't wait for the video to come out. I'll make sure to share it when it goes live!